The Obama administration announced Thursday that it has drafted rules (pdf) that would require federal government to take climate change into consideration for the first time when judging actions under the National Environmental Policy Act (NEPA). NEPA, a 40-year old law, requires the federal government to evaluate the environmental impact of any activity it takes part in or sanctions, whether it's providing funds for a highway or allowing snowmobile riders into Yellowstone National Park. Here's an overview of how NEPA works. According to the latest proposal, any federal agency that took an action that could be reasonably expected to produce 25,000 tons or more of carbon-dioxide per year would come under scrutiny. As well, agencies would have to consider how future warming might impact certain projects—for instance, whether infrastructure built on the coast would be affected by sea-level rise. These reviews would apply to any project regulated by—or, in many cases, significantly financed by—the federal government. 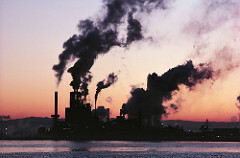 Now, these rules won't amount to a direct regulation of greenhouse gases. And the White House has also carved out some exceptions: For instance, the proposed rules don't apply to land-management actions, such as oil and gas drilling on public lands. (That's something environmentalists have been pushing for.) Mainly, this is just guidance from the White House so that the agencies don't have to figure out for themselves how to approach various climate questions (some agencies have already started to do that on an ad hoc basis, which isn't exactly ideal). Still, even if this isn't a monumental change by itself, it's part of a broader strategy by the administration to carry out a decent chunk of environmental policy through the regulatory agencies, at least so long as Congress dithers. Mike Soraghan of Greenwire has a good piece looking at this trend and contrasting it with the Bush administration's unilateral moves to promote fossil-fuel development. The main downside to this approach, of course, is that a lot of these moves would be relatively easy to reverse by a new president.